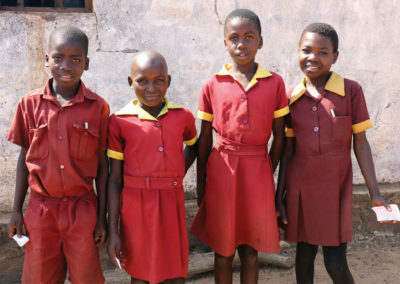 There are about 450,000 children (ages 0-17) living in Zimbabwe who are orphaned as a result of AIDS. 72% of Zimbabwe’s population lives below poverty line. Walter, Conference, Samantha and Kimberly have big dreams. With support from Spitzkop Brethren in Christ Church (Zimbabwe), they are among 200 students who attend Capital Block primary school. Students in grades 1 – 8 walk as far as 10 km each way to attend this five-classroom school, located in a remote, rural area. Seminaries in Africa help Forgotten Voices identify theologically-sound pastors leading ministries that serve orphaned and vulnerable children. Teams from more than 112 local churches, like Gwanda Brethren in Christ (Zimbabwe), partner with our staff to meet children’s unique needs by building upon the strengths of their churches and communities. Download the Forgotten Voices map of Zimbabwe.